How Do the Parts of a Network Work? A router: This little box works as an electronic traffic cop, controlling the flow of information between each computer, as well as between your network and the Internet. Almost all modern routers support both wired and wireless networks. A network adapter: Every computer needs its own network adapter — an electronic mouthpiece of sorts. A wired network adapter lets you plug in a cable; the cable’s other end plugs into your router. A wireless network adapter translates your computer’s information into radio signals and broadcasts them to the router. Network cables: Computers connecting wirelessly don’t need cables, of course. But computers without wireless adapters need cables to connect them to the router. Most home networks resemble a spider, as shown here, with some computers’ cables connecting to the router in the center. 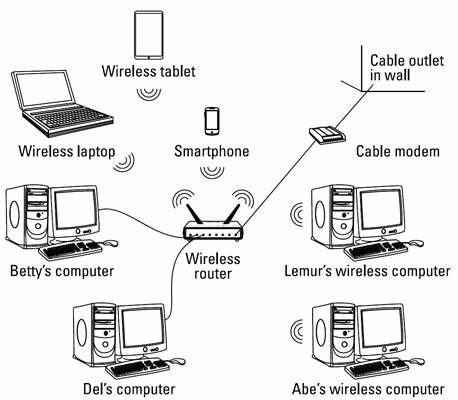 Other computers, laptops, tablets, and gadgets connect wirelessly to the same router. A network resembles a spider, with each wired or wireless computer and gadget communicating with a router near the center. The router divides its attention among networked computers efficiently, letting every computer simultaneously share a single Internet connection. Windows lets every computer share a single printer, as well. If two people try to print something simultaneously, Windows stashes one person’s files until the printer is free and then sends them automatically when the printer is ready for more work. Wireless routers deliver an Internet signal to all connected wireless gadgets, not just Windows computers. After you set up your router, it also delivers your Internet signal to iPads and other tablets, Apple computers, smartphones, and even some home theater devices (such as Blu-ray players, game consoles, televisions, and streaming video gadgets such as a Chromecast or Roku box).